The latest “black mark against domestic cats,” explained a headline in yesterday’s Washington Post: “They’re killing Hawaii’s rare monk seals.” As is so often the case, though, in the age of click-bait journalism, the story is considerably more complicated than the misleading headline suggests. The parallels between The Post’s story and the Scientific American piece from earlier this year, declaring “Cat Poop” a threat to Hawaiian geese, are unmistakable. In both cases, little or no attention was paid to other, more prevalent, sources of mortality. And the fact that the populations of both species are increasing—in the very areas of Hawaii where one would expect to find the greatest exposure to T. gondii—was ignored entirely. All of which feeds into the witch-hunt against outdoor cats, which only impedes conservation efforts. On the other hand: less than 18 hours after Guarino posted his story, 172 comments! * Curiously, Guarino himself is responsible for the most dramatic increase. “All told,” he writes, “the seal population is just over one thousand individuals.” Just two sentences later, though, quoting the Monk Seal Research Program’s Michelle Barbieri from the AP story, he writes, “there’s only about 1,300 seals in existence at this point in time.” Doesn’t anybody proofread this stuff? 1. Barbieri, M.M., et al., Protozoal-related mortalities in endangered Hawaiian monk seals Neomonachus schauinslandi. Diseases of Aquatic Organisms, 2016. 121(2): p. 85–95. 2. 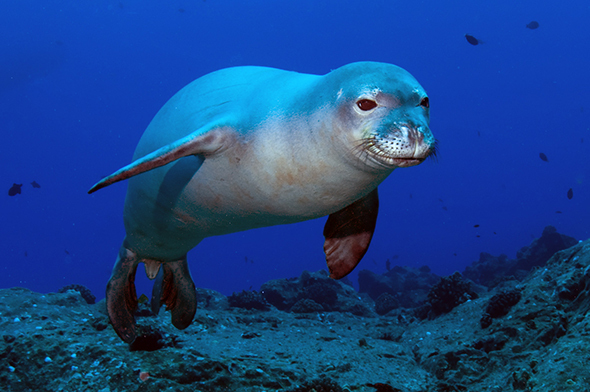 n.a., Priority Actions 2016–2020 Hawaiian Monk Seal Neomonachus schauinslandi, in Species in the Spotlight2016, National Oceanic and Atmospheric Administration, U.S. Department of Commerce. 3. Sprague, R.S., et al., Main Hawaiian Islands Monk Seal Management Plan, 2016, National Marine Fisheries Service, Pacific Islands Region: Honolulu, HI.